Steven G. Poskanzer became Carleton’s 11th president in August, 2010. He developed and led the College through a comprehensive strategic planning process that brought faculty, students, staff, alumni, and parents together to chart Carleton’s course for the coming decade. This plan, Carleton’s Future, is currently in the midst of being implemented. In recent years, the College has seen a significant increase in the number of applications, along with continued success in faculty recruitment. Consistent with its newly-set priorities, Carleton is now dramatically increasing need-based financial aid to both low- and moderate-income students, emphasizing post-graduation career planning and outcomes, and constructing new interdisciplinary science facilities. A scholar of higher education law, Poskanzer’s research focuses on issues of academic freedom and how colleges and universities seek to achieve educational goals in a complex legal and policy environment. At each institution where he has worked, Poskanzer has also made a point of teaching students in the classroom. President Poskanzer received his undergraduate degree from Princeton University in 1980 and a law degree from Harvard University in 1983. After practicing law briefly in Washington, D.C., his entire career has been spent in higher education. He first worked in the Office of the General Counsel at the University of Pennsylvania, becoming the University's Associate General Counsel. He then spent a year as an American Council on Education Fellow back at Princeton, working as an assistant to the University’s Provost. 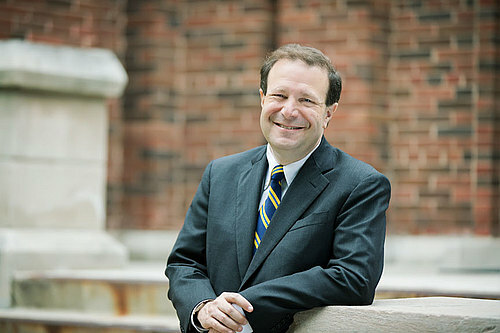 In 1993, Poskanzer moved to the University of Chicago, where he served as Executive Assistant to the President and, among other duties, was responsible for the University’s Public Affairs department and for policy planning for the Board of Trustees. In 1997, Poskanzer shifted from private to public higher education, joining the State University of New York (SUNY). Initially based in Albany at SUNY’s System Administration, he quickly rose to the position of Vice Provost for the 64-campus System and headed the Office of Academic Affairs. From 2001-2010, Poskanzer served as President of SUNY New Paltz. New Paltz dramatically enhanced its student and faculty quality and its overall academic reputation during Poskanzer’s tenure, including being recognized by Newsweek as the “Hottest Small State School” in America. Steve is married to Dr. Jane Nofer Poskanzer, a clinical child psychologist who specializes in the diagnosis of autism and related disabilities. The couple has two children: Jill, a graduate of Carleton who works in the television industry; and Craig, a senior at Princeton University.